John Lennons’s 1956 Austin Princess attracts the most attention for RM Sotheby’s London 2016 sale but an Aston Martin DB4GT may bring the top result. Several Aston Martins will be available together with a number of Ferraris, including an Enzo and F40, a Mercedes Benz 300 SL, a classic pre-war Alfa Romeo and a few Porsches. RM Sotheby’s will hold its London sale at Battersea Evolution on 7 September 2016 in partnership with the Concours of Elegance at Windsor Castle. Austin Princess cars are rarely the star of the show but the 1956 Austin Princess, estimate upon request, on offer at RM Sotheby’s London 2016 sale was the car of a star. This Austin Princess belonged to John Lennon and was used by him and Yoko Ono in the 1972 film Imagine. 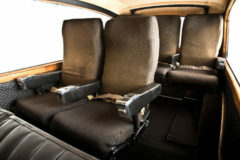 The car is still fitted with the five aeroplane seats in the back that Lennon added to the Austin. 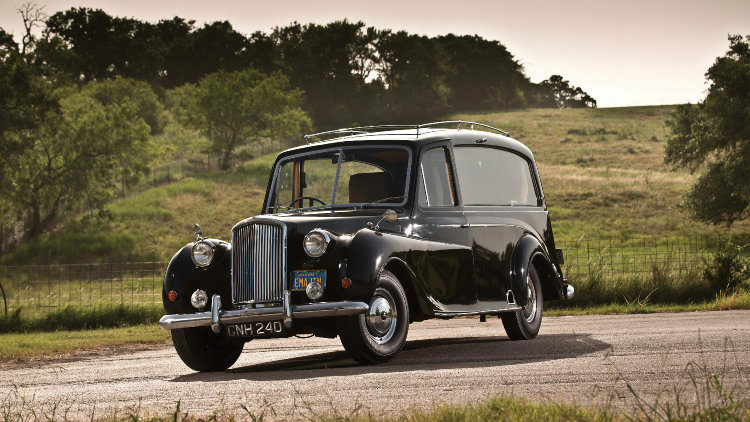 According to RM Sotheby’s, Austin Princess limousines were a popular mode of transport for The Beatles, and a number of them passed through the hands of Apple Records for use by the various band members. It is understood that the large rear door aperture made quick access to the vehicle an easy undertaking; a quality much appreciated when being chased by hundreds of adoring fans! 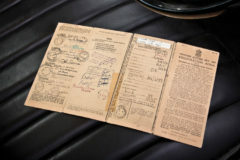 The car on offer is complemented by its original vehicle registration/title document, signed by Lennon when he purchased it on 26 August 1971. The sale of this Austin Prince, which was donated to the Austin Rock and Roll Car Museum in Texas in 2008, provides a rare opportunity for a collector of Beatles or music industry memorabilia. A portion of proceeds from its auction will be donated to UNICEF, which was a favorite charity of Lennon’s. Other charities set to benefit from its sale include Make A Wish America and Dell Children’s Medical Center. A 1960 Aston Martin DB4GT, chassis no. DB4GT/0126/R, estimate £2,200,000 – £2,500,000, is the most valuable car on offer at the RM Sotheby’s London 2016 sale. This DB4GT is a right-hand drive model and is one of just 75 factory-built Aston Martin pure-breds, presented in original condition and with matching numbers. This 1960 Aston Martin DB4GT is one of just three GTs known to have been fitted with rear seats, and one of just 45 right-hand-drive cars. It is perceived to be one of the most original DB4GTs available on the market today, with no evidence of accident or repair – a rarity for track-prepped vehicles. The car will be on preview at the Concours of Elegance within the grounds of Windsor Castle in the days prior to the sale. The 1963 Aston Martin DB4 Series V Convertible, chassis no. DB4C/1102/R, estimate £950,000 – £1,100,000, is even rarer than the DB4GT with only 70 examples built. This late-production Series V version, finished in Platinum over Red leather, has the desirable ‘overdrive’ gearbox. It has decades of known history and has been immaculately restored and preserved by well-known enthusiasts to concours-standard condition. A 2003 Enzo Ferrari has a fairly low estimate of £1,200,000 – £1,400,000. Enzos have sold for significantly more at recent auctions. A bid of over $2 million failed to secure one at Mecum Monterey 2016, while a second one at the same auction sold for $3.3 million. A 1960 Ferrari 250 GT Cabriolet Series II, estimate £1,000,000 – £1,350,000, will be at least the seventh of the 201 examples built on offer at auction this year. Estimates at recent auctions have been lower than earlier in the year when several failed to sell. A 1939 Alfa Romeo 6C 2500 Sport Cabriolet, estimate £1,000,000 to £1,200,000, is the earliest known Touring-bodied 6C 2500 Sport Cabriolet. High-value Alfa Romeos often fail to sell at auction although a 1939 Alfa Romeo 8C 2900B Lungo Spider set a new marque and pre-War record when it achieved $19,800,000 at RM Sotheby’s Monterey 2016 and a day later a 1933 Alfa Romeo 8C 2300 sold for $11,990,000 at Gooding Pebble Beach 2016. The 1957 Mercedes Benz 300 SL Roadster, estimate £900,000 – £1,000,000, is one of around 30 originally finished in Strawberry Red Metallic. It has its original matching-numbers engine and was restored in 2014 by Mercedes Benz Classic Center. No collector car auction these days seems complete without a Ferrari F40 and the 1990 Ferrari F40, estimate £885,000 – £1,100,000, is a single ownership Italian-specifications car that has covered 5,700 km from new. It is still fairly rare for a Porsche 911 to sell for more than a million dollar but the 1995 Porsche 911 GT2, estimate £750,000 – £850,000, is more valued than most. It is one of around 57 road-going 993 GT2s built and from the last great air-cooled 911s. Mecum twice sold Porsche Carrera GTs for over a million dollar but no other auctioneer has managed it thus far. Pre-auction estimates are generally down from earlier in the year when it was often hoped that a million dollar would be the new norm. The 2005 Porsche Carrera GT, estimate £600,000 – £650,000, will be at least the 18th exampled offered at auction this year.